Even though school has started, I’m not quite ready for summer to end. Labor Day traditionally marks the end of summer, but in actuality summer goes until September 22. So, to celebrate [and keep the feeling of summer alive as long as possible! ], I decided to make some tropical granola. Because nothing is more summery than the tropics! 🙂 And, I have 10 pounds of oats from Costco to use up. 10 pounds! Gotta love bulk shopping. Homemade granola sounds scary, but is actually really easy. I may never buy store-bought granola again. Feel free to mix and match based on your tastes and what’s in your pantry, and the seasons of course. I have some great ideas for wintery granolas…. yum! But for now, I’ll enjoy the flavors of summer for a little while longer! In a large bowl, combine oats, wheat germ, wheat bran, sunflower seeds, salt, cinnamon, and ginger. In a 2 cup measuring cup, mash banana and then mix in applesauce, honey, coconut oil, and vanilla. Using a wooden spoon, stir the wet ingredients into the dry ingredients and spread mixture into the prepared pans. In a small bowl, whisk egg white until fluffy and frothy. Drizzle egg white over the granola mixture in the pans. Pop pans in the oven. Bake for 20 minutes, remove from oven and flip granola so it cooks evenly on all sides. You may also want to rotate the placement of pans in the oven based on how your oven cooks. Bake for an additional 20-30 minutes until your granola is crisp but not burned. I baked mine for 25 minutes and felt that it was too dark [at least the pan on the top rack], so next time I’ll probably take it out sooner. Place pans on cooling racks to cool. 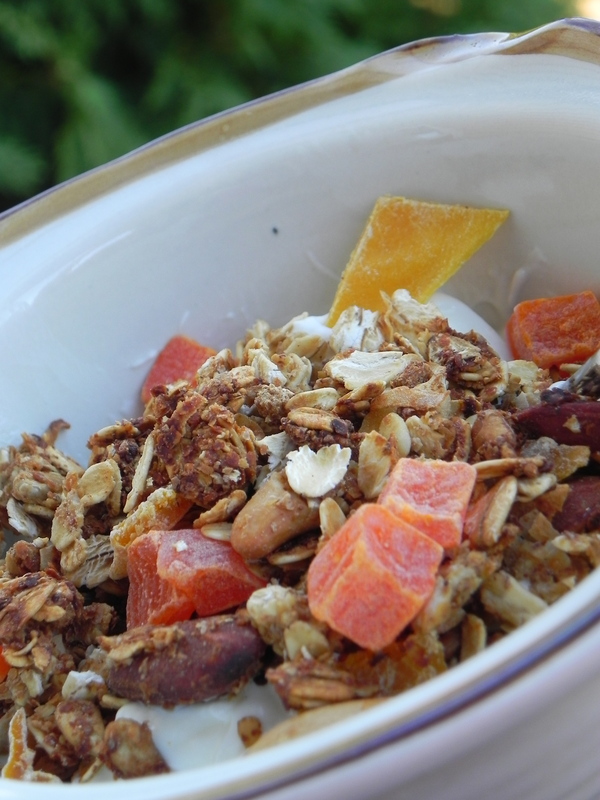 Once granola is cool, mix in dried fruit and nuts and enjoy! I love mine as a topping over greek yogurt. Yum! What are your favorite ways to enjoy granola? 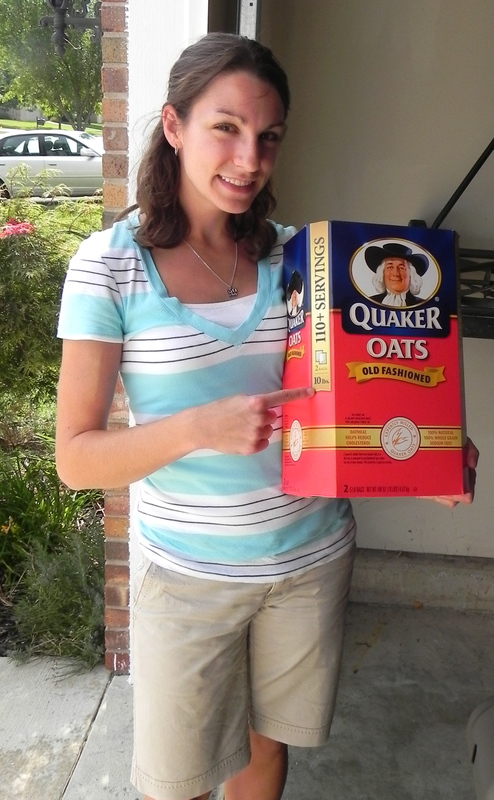 I have a big box of oats like that from Costco too! 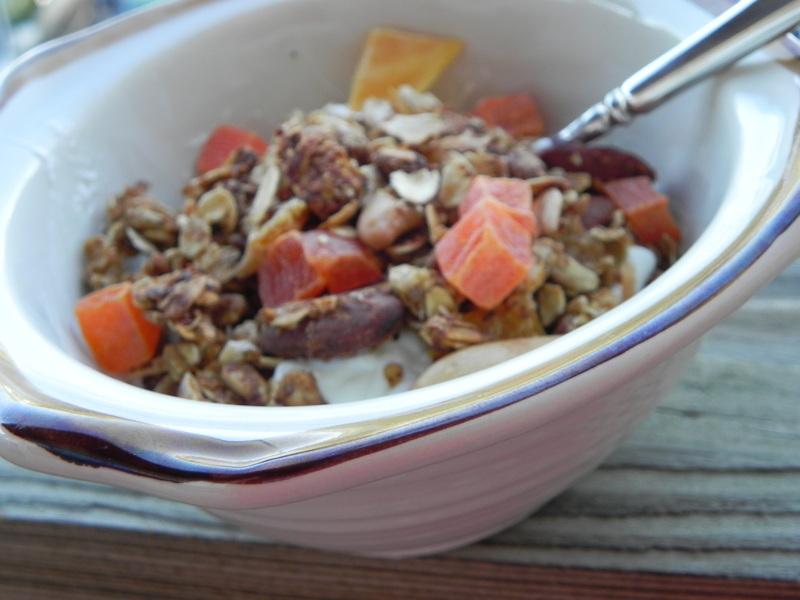 I love granola on yogurt or as a bowl of cereal. haha my grandpa & my mom made fun of me for getting 10 lbs but it was so cheap and they are so good! I love that you add mashed banana into the mix–I’ve never seen that in a granola recipe, but it’s such a neat idea. Looking forward to seeing more of the wintery granola recipes, too! Looks great! I have made granola once or twice out here and it is always fun. 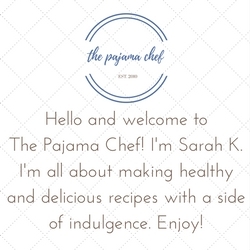 I definitely want to experiment with some new recipes! Fun! Can you get dried fruit in Moz? I’ll be honest, my love of dried tropical fruit knows no bounds. I want this. Wow, that is one huge bin of oats! =) You know, I’ve never made my own granola, but I’m sensing it may be time to try . . .
wow? super delicious cafeteria food? crazy! never tried it on ice cream. sounds good! Wow, that looks great! I’ve never made homemade granola. I think I may have to give it a try now!